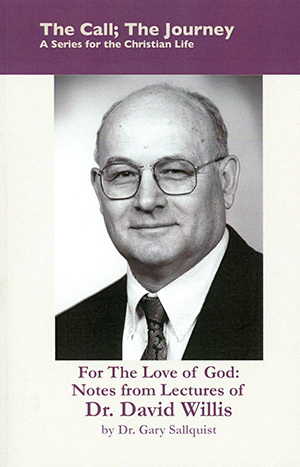 For the Love of God: Notes from Lectures of Dr. David Willis highlights the teaches from Dr. Willis's classes at Princeton - where he served as Chairman of the Theology Department. Dr. David Willis is the Charles Hodge Emeritus Professor of Systematic Theology at Princeton Theological Seminary. He completed his doctorate in Historical Theology at Harvard and was the Assistant Minister of Harvard Memorial Church when George Buttrick was pastor. He is deeply involved in the ecumenical movement and was co-chair of the first series of dialogues between The Vatican and the Reformed churches on the international level. Dr. Willis is the author and co-author of eight books ranging on topics from: Daring Prayer, Baptism, Decision and Growth, The Context of Contemporary Theology, Notes on the Holiness of God.